Welcome to a new feature on Holly Recommends. Sometimes while daydreaming about trips I want to take I come across combinations that aren’t for me, but might be perfect for someone else who wants to get away on a budget. I can’t promise you that the flights and hotels are going to be comfortable, or even safe. I’m just going to guarantee that right now, as I type this, these trips exist and they are very, very cheap. Today’s deal is from Chicago to Houston. It’s a direct flight with no stops. You’ll leave the evening of Monday, April 20 and return Tuesday, April 28. Your roundtrip ticket is just $78.20. Yes, that is roundtrip, all fees and taxes included. On Spirit you can’t bring anything but a tiny bag, so pack really, really light. Next, I’ve found you a hotel with a pool and free breakfast for just $36.00 night! This means you and a guest could have an 8 day vacation for just $444! What a bargain! Car rental, additional meals, and entertainment not included. For more information visit Priceline.com as soon as possible before this deal goes away. 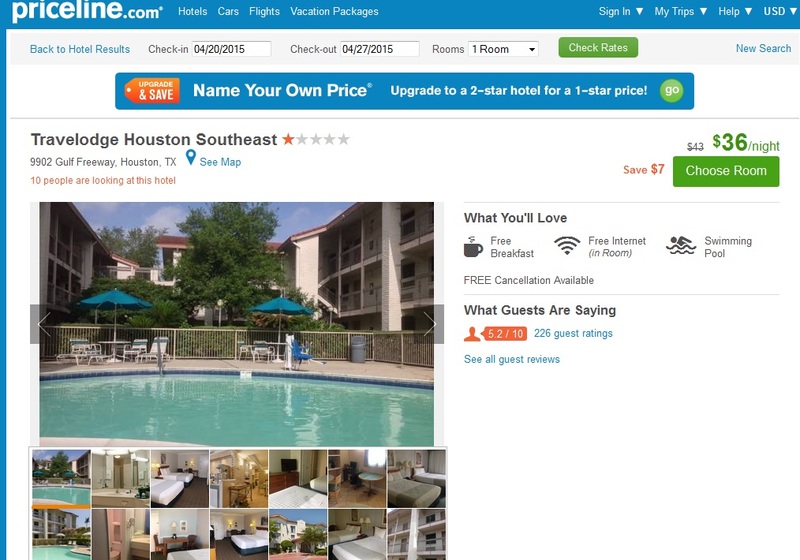 I am not affiliated with Priceline or any other travel site, hotel, motel, or airline.